(NaturalNews) Parents who exercise their God-given right not to vaccinate their children face a growing onslaught of threats from some in the medical community who, apparently rejecting the oath they swore to "do no harm," are now violently refusing to treat anti-vaccine parents unless they conform to the vaccine agenda. One such militant doctor is Charles Goodman, a Los Angeles-based pediatrician who recently posted a notice in his waiting room and on Facebook that he will no longer see unvaccinated children. His personal opinion that unvaccinated children are a threat to the vaccinated has overridden his commitment to provide care for all of his patients, a growing sentiment within the pro-vaccine religion. The mainstream media is spuriously describing the phenomenon as "tough love" by doctors supposedly acting in the interest of public health. But this boorish trend of discrimination is no different from tagging non-conformists with yellow stars or pink triangles, which those familiar with history will recall led to millions being murdered in firing lines and gas chambers. Your personal opinion on vaccines is your business (unless, of course, you consider the fact that the vaccinated are often responsible for spreading disease, which makes vaccines a serious public health threat: more on this is available here). But trying to force your opinion on others using intimidation and coercion is a whole different story. Nobody can force you or your family to get vaccinated: know your rights! Oh, but the risk of developing these serious reactions in response to the vaccine is minimal, they say. Minimal or not (even this is debatable, considering the autism rate is now 1 in 68, up from less than 3 per 10,000 in the 1970s), the risk is still real. The risk of developing measles, on the other hand, is minimal. Even if a person develops measles naturally (which is actually preferable as a child, much like chickenpox), the condition is generally mild. And once the individual recovers, he or she then has lifelong immunity to the disease. The same cannot be said of the MMR vaccine, which in a best-case scenario only provides temporary immunity at a cost of damaged immunity, or worse, permanent autoimmune disease. "Many children (and adults) receive vaccines and shortly thereafter have a serious reaction, often requiring emergency hospitalization," explains the ThinkTwice Global Vaccine Institute. "Such reactions include seizures, autism, immunological damage, neurological damage, sudden infant death syndrome, and/or a number of other rare and elaborately named 'new' diseases." Compulsory vaccination, in other words, is forced pharmaceutical drugging, something that the U.S. Constitution prohibits. Informed consent is the foundation upon which any civil medical system is built -- this means that nobody, including a child's parents, can be forced to accept a medical treatment of which they're in opposition, which includes vaccines. At least four families in the Rochester area of New York are refusing to be bullied by their pediatricians over vaccines, having recently filed a lawsuit alleging discrimination over their choice not to vaccinate. 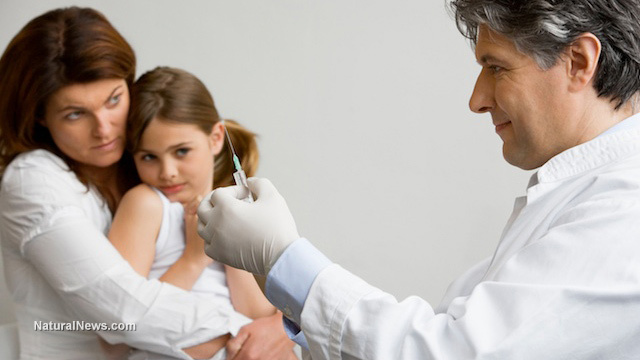 Reports indicate that several area practices have received complaints in recent weeks with parents outraged over being treated like second-class citizens for refusing vaccinations.